We had taken Matilda to hospital as she had been experiencing pain in her neck, but the hospital just thought she had had neck pain. So we carried on and we were due to take Matilda for a routine eye check-up. During this check-up, it became clear Matilda wasn’t able to read the biggest letters on the chart. 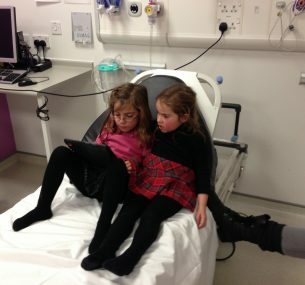 The optician then checked Matilda’s eyes and found she had raised pressure within her brain. We were told to go to hospital straight away, so we took her to Moorfields Eye Hospital. They did some checks and said the problem wasn’t her eye. 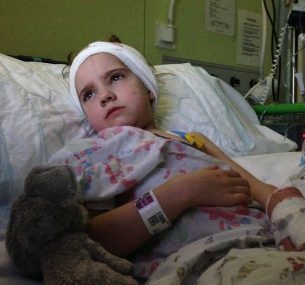 We were rushed to another hospital and were soon being told that Matilda had a tumour the size of a plum in her head. A week earlier a boy in her school had died of a brain tumour and every kind of scenario runs through your head. Meanwhile, we had to stay as strong as we possibly could and somehow let our lovely child know what was happening to her. We decided we had to tell her and be honest with her and to try and tell her without frightening her. We explained that she had a big tumour inside her and it was a bit like a big blob. Matilda quickly nicknamed the tumour, Bob the blob. She was okay, but could sense the anxiety in us. Within two days of a routine eye test, our lives had completely changed and Matilda was in surgery. Even on the day of the surgery, she still looked fine. As she walked into the ward hand in hand with her sister, the nurse asked ‘which one of your children is ill’? We went to the surgery via the disco lift, but suddenly everything became very clinical. Matilda had to be knocked out with morphine to keep her still. She would be completely sedated for 24 hours. The day of the surgery was the longest day of our lives. We were advised to go for a walk whilst the surgery took place. After a while we tried going for a small walk nearby, but couldn’t face everyone else going about their daily lives, whilst we were in complete agony, not knowing if our Matilda would make it through the surgery and if she did how she would be. We had been warned her motor skills could be affected and she could have paralysis of at least one part of the body. After the surgery had finished she gradually woke, a very different, sleepy child. She then started moving and trying to remove all the tubes attached to her. I could see her fighting and that she didn’t like the situation she was in. Although it was so difficult to see my daughter like this, I was relieved as it showed me that she was getting better. Soon she was swallowing, being active and telling us she doesn’t like it. Within 72 hours, we were told by the medical team that they were very hopeful. We were told the tumour was a grade one and that it had probably been growing from birth, or from a very young age. This was why she had been slightly deaf in one ear and had eyesight problems. The doctors were so pleased with how the surgery had gone that they weren’t going to do any chemotherapy or radiotherapy. 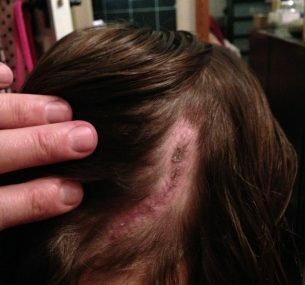 They believed they had been able to remove at least 98% of the tumour. We could now try and focus on the next stage of the process – doing all we could to help Matilda feel well again. I can remember one day in the weeks after, as we watched a film together at home, Matilda really laughed at a film and I thought ‘we have our Matilda back’. She then got stronger and stronger each day. 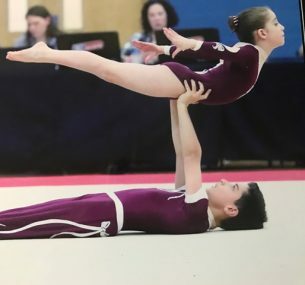 I’m very proud to say five years on Matilda is now a national gymnastics champion. But not a day goes by when I don’t think about childhood cancer, Matilda and all the other families we met. The whole experience was a bit like being on a rollercoaster. It was immediately very scary and unsettling, then after a few weeks you sort of get into a routine. You’re then told that you can take your child home and you leave the safety net of the hospital and wonder what has happened, is this constantly going to go on? During all this you see a whole cycle of parents coming in at different stages onto this rollercoaster. We still get nervous when we take her for an MRI scan and think we always will. People say she looks fine, but she looked fine for five years as the tumour grew inside her. She wears glasses and occasionally has eye problems, but we’ve been extremely lucky. 10 years ago they couldn’t have got to where they did in the operation that saved her. We are extremely grateful for the research, all the wonderful staff who helped her and everyone that paved a way to help her. Matilda has made and sold loom bands for charity, she knows how important others have been in her being with us today. Imagine if you had to tell your child they had cancer. How would you feel? Every day the parents of 10 children and young people in the UK have to do this and it’s terrifying. I act in the hospital drama Holby City, but I’m also an ordinary mum, who had to face every parent’s nightmare, when I heard the shocking words ‘your daughter has cancer’. Listen to Kaye’s Radio 4 appeal here.